This NASA/ESA Hubble Space Telescope image shows a spiral galaxy known as NGC 7331. First spotted by the prolific galaxy hunter William Herschel in 1784, NGC 7331 is located about 45 million light-years away in the constellation of Pegasus (The Winged Horse). Facing us partially edge-on, the galaxy showcases it’s beautiful arms which swirl like a whirlpool around its bright central region. Astronomers took this image using Hubble’s Wide Field Camera 3 (WFC3), as they were observing an extraordinary exploding star — a supernova — which can still be faintly seen as a tiny red dot near the galaxy’s central yellow core. Named SN2014C, it rapidly evolved from a supernova containing very little Hydrogen to one that is Hydrogen-rich — in just one year. This rarely observed metamorphosis was luminous at high energies and provides unique insight into the poorly understood final phases of massive stars. NGC 7331 is similar in size, shape, and mass to the Milky Way. It also has a comparable star formation rate, hosts a similar number of stars, has a central supermassive black hole and comparable spiral arms. 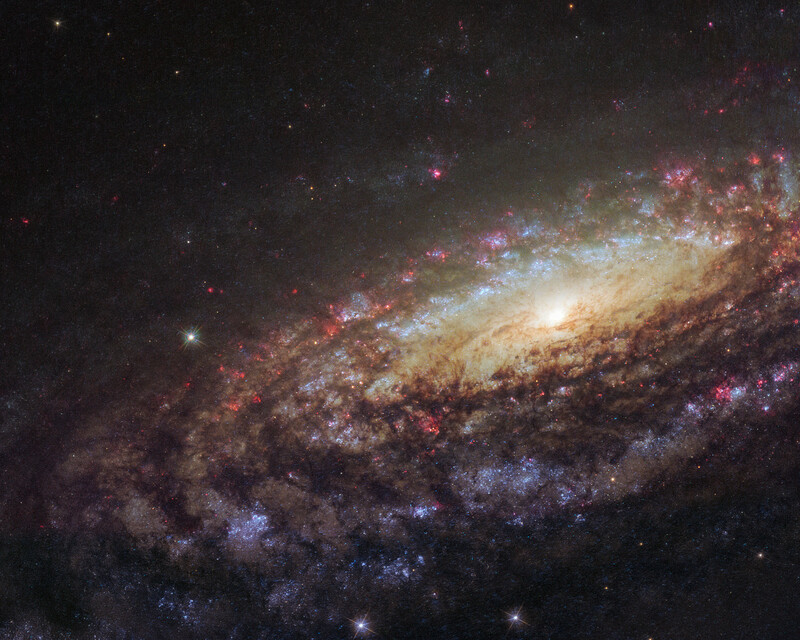 The primary difference between our galaxies is that NGC 7331 is an unbarred spiral galaxy — it lacks a “bar” of stars, gas and dust cutting through its nucleus, as we see in the Milky Way. Its central bulge also displays a quirky and unusual rotation pattern, spinning in the opposite direction to the galactic disc itself. By studying similar galaxies we hold a scientific mirror up to our own, allowing us to build a better understanding of our galactic environment which we cannot always observe, and of galactic behaviour and evolution as a whole. Position (Dec): 34° 24' 31.42"